The Babington Tilt Skillet was designed at the request of Air Force and Marine Corps food service personnel. Commercial tilt skillets, available from a variety of manufacturers, normally operate on gas or electricity. In a military environment, natural gas is not available. Electric skillets require an inordinate amount of generator support. The Babington Tilt Skillet utilizes the same Babington Airtronic burner used in all Babington military appliances. This gives the military cook a tilt skillet that operates on the same battlefield fuel as other feeding systems, and requiring a minimum of electrical power. 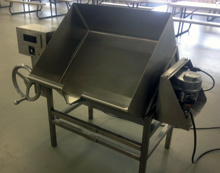 Tilting skillets are used to prepare a variety of menu items in large quantities. Some examples include scrambled eggs, braised meats, soups, stews, sauces, gravies, pot roasts and even mashed potatoes. With a perforated liner, the tilt skillet can even be used to prepare UGR Heat& Serve Rations and Boil in the Bag menu items. The variety of menu items that can be prepared in a tilt skillet is limited only by the cook's imagination. What makes a tilt skillet desirable in a military cooking environment is the same quality that makes it desirable in a commercial restaurant; flexibility and footprint. This single appliance can be used alternatingly as a fryer, a kettle, a braising pan a griddle and a food warmer. When you don't have room for multiple appliances, the tilt skillet is the next best choice. Available in a variety of sizes, the most commonly requested version is 30 gallons. 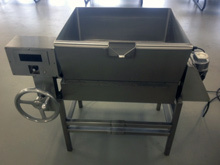 Large capacities allows for the preparation of large amounts of food in a single pan. Cooking time of most products is reduced by up to 20%. 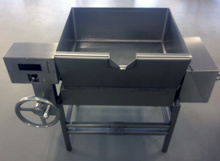 Tilting feature facilitates transfer of food to serving pans without heavy lifting . The Babington Tilt Skillet can operate at very low warming and simmering temperatures to a high of 450 degrees for grilling and searing of meats. Most grilling type applications require a cooking temperature of about 350 degrees. Fresh Food Preparation. A great variety of fresh prepared menu items can be prepared in the Babington Airtronic Tilt Skillet. Simply follow the directions of the recipe. Preheat the skillet to the desired cooking temperature and then proceed with the cooking. Observe the LED Display frequently to monitor actual cooking temperatures and adjust accordingly. Grilling, stir frying, simmering, stewing and boiling can all be performed with the tilt skillet. Use it as you would any commercial tilting skillet or braiser. Unitized Group Ration Heating Requirements. UGR Heat & Serve rations, commonly referred to as tray packs, are available in a variety of menu selections. Most items are packaged in either 9 or 18 portions per package. The required heating time is unique to each type of menu item and is dictated by the specific density of the packaged product. Heating times for specific products are printed on the tray pack packaging. In general, most UGR H&S products require immersion in simmering water of 40 – 45 minutes. Denser products, such as mashed potatoes or refried beans, may require simmering for as long as one hour. Boiling UGR H&S packages is not recommended as it may create internal tray pack over-pressures, leading to scalding of personnel assigned to open such a pressurized tray pack. Heating Commercial Boil-in-bag Rations. The Tilt Skillet has an optional perforated, food grade, stainless steel liner. This liner shields the hot surfaces of the skillet’s bottom and exhaust-end wall, thereby preventing contact with, and potential melting of polyvinyl packaging materials. The Tilt Skillet, with liner, can cook or reheat commercial boil-in-bag products in a manner consistent with the food manufacturer’s recommendations. These recommendations, while specific to each product, is generally to immerse at gentle simmering temperatures. Burner System. The Tilt Skillet comes with an Airtronic burner with the capacity to heat the skillet to any target temperature up to 450 degrees. The burner is securely attached to one end of the skillet and is capable of being quickly and easily removed for maintenance or replacement. The Airtronic burner meets Underwriter Laboratories (UL) Standard No. 296. Fuel Utilization and Consumption. The Airtronic burner is self-priming and operates on the complete family of distillate fuels. These include, but are not limited to, DF1, DF2, arctic, and JP8 diesel fuels. The Airtronic burner has a variable firing of .2 gph - .6 gph. Adjusting the firing rate is accomplished with a single screw-type mechanism. No parts changes are required. The high efficiency heat exchanger in the Tilt Skillet allows a medium burner setting (about .40 gph) to satisfy all cooking and heating requirements. Electrical Control Box. The electrical control box is waterproof and contains a single knob to turn on and set the desired cooking temperature. Two LED panels indicate desired temperature and actual temperature. Voltage and Current. The Tilt Skillet operates on 120 VAC, 50/60Hz, with a maximum current draw of about 150 watts. Safety. The Tilt Skillet is safe to operate, but caution must be exercised when using in modes that do not require large amounts of liquid. Monitor cooking temperatures closely to avoid accidental overheating and scortching. Noise. The Tilt Skillet ?does not produce noise in excess of 78 dba when operating. Weight. The dry weight of the empty Tilt Skillet is: ?pounds. Materials. The Tilt Skillet is made from corrosion resistant stainless steel. Materials used meet food contact surface requirements for inside the skillet and lid, as specified in NSF International Standard No. 51, See Chapter 4, section VI, TB MED 530. All outside surfaces of the Tilt Skillet are easily cleanable. Electrical Wiring. Electrical wiring in the Tilt Skillet conforms to the requirements of UL Standard No. 62, and is arranged, supported, and marked to allow identification with the wiring diagram. Maintainability and Repairability. Routine maintenance and repair of the Tilt Skillet requires only standard hand tools. All electrical and control elements are conveniently located to offer ease of accessibility. Identification Plate. An identification plate, made of corrosion resistant material, is permanently attached to the outside of the unit. The plate includes the manufacturer’s name, contract number, date of manufacture, and the Commercial and Government Entity (CAGE) Code number. Caution Labels. A caution label containing the words “CAUTION- MAY BE HOT” is securely attached to a readily visible location exhaust end of the Tilt Skillet. An additional warning label cautions against the use of gasoline as a fuel and is visible at the burner end of the unit. Operating Instruction Plate. A corrosion-resistant, permanent data plate containing complete operating instructions for the tilt skillet is under development. Welding. All welding performed in the manufacture of the Tilt Skillet is in accordance with the requirements of AWS Standard No. D1.6. Operating temperatures. The tilt Skillet is operable and functional at ambient temperatures of ?50?F to + 120?F. Altitude. The Tilt Skillet is operable at altitudes up to 8,000 feet above sea level with proper air mixture adjustment. Rain. The tilt skillet is operable after being exposed to rain. Corrosion. The tilt skillet is made of high grade stainless steel. As such, it should suffer no penetrating corrosion, deterioration, clogging or binding of moving parts, or change in tolerance limits on any internal or external parts when exposed to a corrosive environment. Vibration. The tilt skillet will remain operable after being subjected to vibration. Fuel Line. A fuel line hose with drip resistant quick disconnects at both ends is designed to be attached between the fuel can and the tilt skillet. The fuel can adapter is permanently vented so that the fuel pump in the burner will properly draw fuel from the fuel can. The supply side line contains a transparent, plastic, vehicle type, in-line fuel filter that can be easily replaced using a flat tip screwdriver. The length of the fuel line is 12.5 feet long, allowing placement of the fuel can at a safe distance from food or hot surfaces. Power Cord. The tilt skillet is equipped with a fuel and water resistant, 16 gauge, 3-wire, 12-foot long power cord. The cord is capable of supplying sufficient power to operate the tilt skillet and conforms to UL Standard No. 62; and flame resistance requirements of MSHA, Title 30, Part 18, Section 18.64, Part 7, and Subpart K, Section 7.407. The Babington Tilt Skillet can be used alternatingly as a fryer, a kettle, a braising pan, a griddle and a food warmer. When you don't have room for multiple appliances, the tilt skillet is the next best choice.